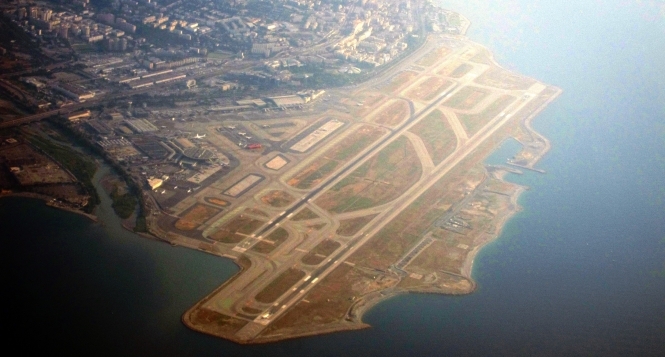 A potential disaster was averted at Nice Côte d'Azur airport when a pilot confused a taxiway with a runway after being cleared for take-off, it has emerged. A local air traffic controller only spotted the pilot's mistake after the plane had travelled nearly a kilometre along the concrete and reached a speed of 170kph. Take-off was aborted and the pilot turned the craft around and headed to the correct runway. The Embraer 190 craft, which can carry up to 100 passengers, then completed its scheduled flight to Lisbon without further incident. The Bureau d’enquêtes et d’analyses has launched an investigation into the 'serious' but 'extremely rare' event. The taxiway in question at Nice is a former runway and therefore wider than standard taxiways, but its marking and lights clearly indicate it is not to be used for takeoff or landing.